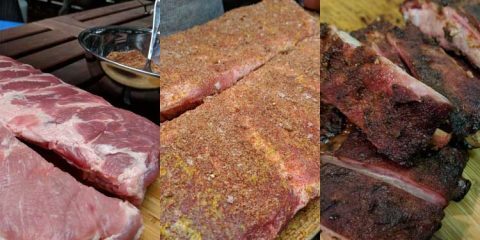 Pellet grills might just be the hardest type of smoker to buy. It seems like there’s a new challenger being released every couple of months so it can be hard to keep up. What’s more it can be hard to understand what features you need and what are just gimmicks. One problem some people have with pellet stoves is their lack of portability. However, there are quite a few pellet stoves on the market today which can be moved from place to place with general ease. One of these is the REC TEC Mini Pellet Grill. Possessing a wide range of heat capabilities, a portable design, and a good deal of cooking space, it’s not the absolute best portable pellet grill around, but for the price it performs excellently in the small to mid sized range. While it has “mini” in the name, the REC TEC Pellet Grill is really more of a mid sized smoker. 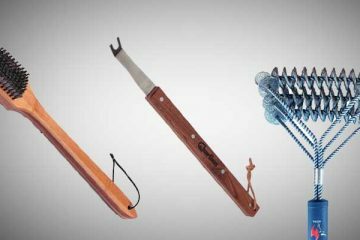 If you’re looking for a truly portable pellet grill you are probably better off with the Davy Crockett Grill from Green Mountain. But if you are looking for a reasonable sized pellet grill for the house that has some portability, the REC TEC Mini is a solid choice. It possesses mid-level functionality at a mid-range price. It’s not the biggest or most powerful pellet grill you’re going to find, but it does offer exceptional storage and transfer capabilities. This makes it an excellent choice for tailgating situations in which it must be transported in a vehicle. Equipped with foldable legs for compact storage, it weighs in at around 100 pounds. While it’s not as light as some grills, it’s not inordinately heavy either. It measures in at 33 inches x 16 inches x 41 inches when completely folded out. It’s, unfortunately, not the highest sitting grill you’re going to find. If you’re tall, you might have to bend down in order to use it. One of the best things about this grill apart from its portability is its ease of use. Equipped with an internal thermostat, it can adjust temperatures at 5 degree intervals. Possessing a 341-inch cooking grate, it can handle around 12 burger patties at one time; quite a bit of food for a tailgating grill. Unique design – The red lid and and ‘bull horn’ handles make the REC TEC one of the most striking designs around. Get ready to make a lot of people jealous when they see it. Extremely portable – Equipped with wheels and portable legs, this pellet grill is very easy to store and take from place to place. While it’s a little heavy at 100 pounds, its portability features make that a null point. 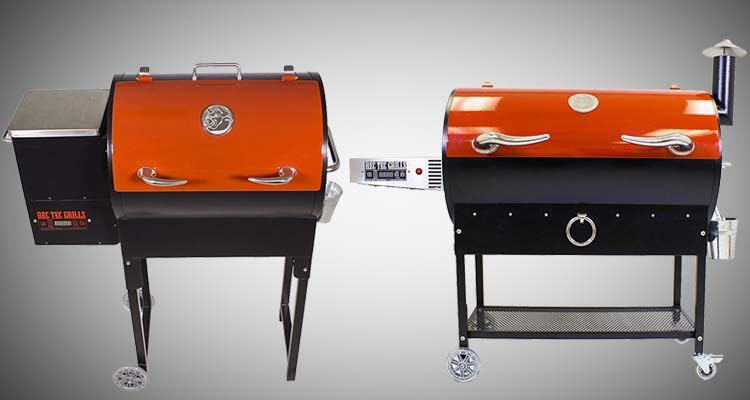 Equipped with a built-in thermostat – This grill possesses a built-in thermostat for ultimate temperature control. The thermostat works in 5 °F increments, allowing you to adjust between 180 °F and 550 °F. 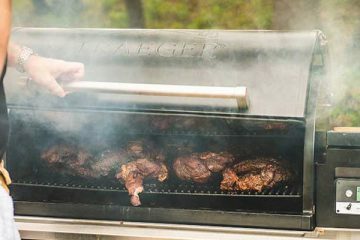 Maintains Temperatures Well – Regardless of what kind of weather you’re grilling in, this grill does a superb job of maintaining temperatures. Typically, temperatures won’t alter by more than 2 or 3 °F. 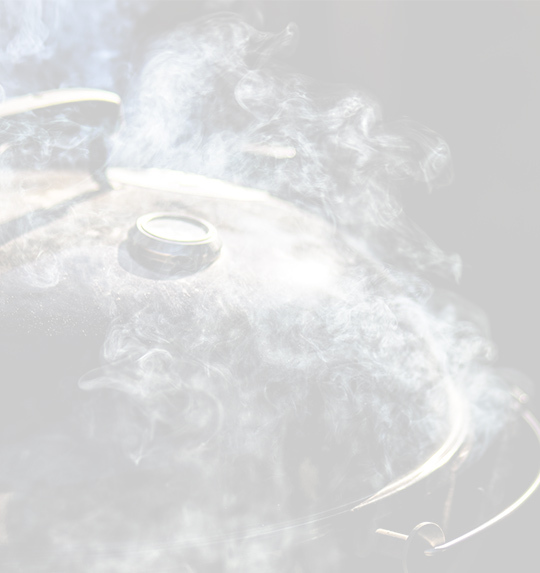 Only produces moderate smoke levels – This is pretty common with pellet grills, but the Mini doesn’t exactly produce the same level of smoke as a charcoal smoker like the Smokey Mountain. If you think this is going to be a big problem, you can fix it with the addition of a cheap Pellet Tube smoker. On the Expensive Side for a portable grill – Compared to other portable pellet grills the REC TEC is a little on the expensive side. But because you get much more cooking space and better build quality it’s still reasonable value. For the most part, the REC TEC Mini Pellet Grill possesses exceptional construction and design quality. For a grill in its price range, its structural integrity can’t be matched. It’s as solid as a portable pellet grill comes. Measuring in at 16 inches x 33 inches x 41 inches when its legs are folded out, it does sit a little low. This can be troublesome for some users, particularly those who are on the tall side. If you are tall, you might be better served by a grill that sits a little higher. There’s nothing worse than having to perpetually bend over while grilling. StokedOnSmoke have a nice thorough video looking at the REC TEC mini. You can also see how it compares to the Standard, which we’ll cover further down in the review. The truly nice thing about this grill is that its legs have the ability to fold up. When its legs are folded up, it measures in at about 2 feet shorter, making it compact and very easy to store away. It should be noted that this grill is a little on the heavy side for a portable grill. It weighs in at around 100 pounds so we would recommend 2 people for moving it. Made out of heavy-duty metal, its hood is equipped with handles for easy opening. Equipped with a built-in thermostat, it adjusts temperatures at 5 °F increments. 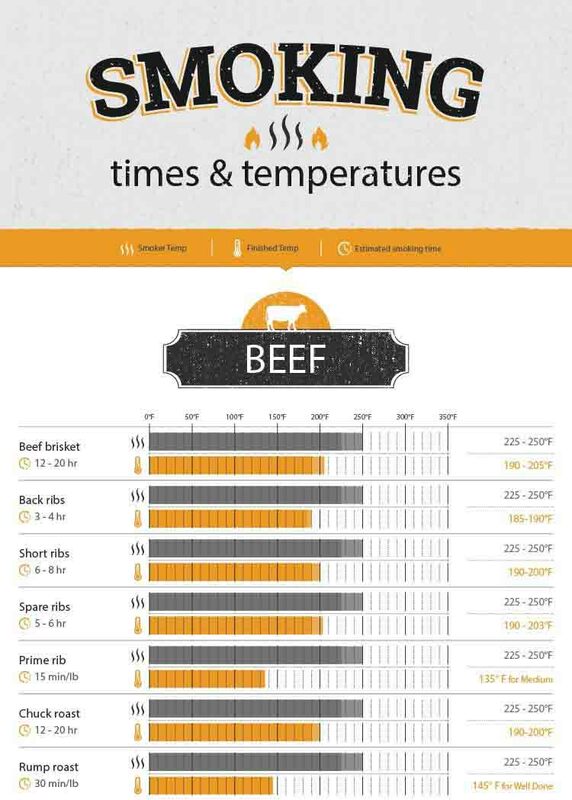 Its cooking temperatures range from 180 °F to 550°F; a huge temperature range, especially for a grill of its size. This grill sports a container that can hold up to 15 pounds of wooden pellets at one time. This allows it to burn consistently over quite long periods of time. When it comes to ease of use, this pellet grill is about as good as they come. It’s design in a manner in which it does essentially all of the heavy work for you. All you have to do is add your pellets to the pellet container. It plugs into an electrical outlet which will power its thermostat-driven heating system. After adjusting its thermostat, it will deliver a heat that accommodates your chosen temperature to within 2 or 3 °F. Regardless of what the temperature is outside, it will thrive. This allows you to leave it be for a while so that you can converse and focus on other matters; a luxury not afforded to you with many other grills. Possessing a fairly large cooking grate of 341 square inches, it allows you to cook around 12 hamburger patties at one time. 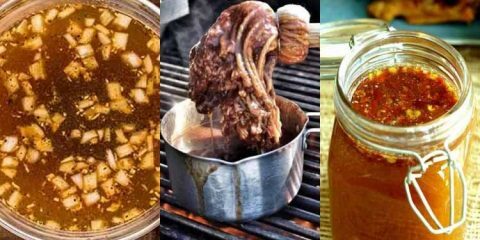 This will enable you to cook a great deal of food in just a short amount of time. It’s not quite equipped to handle large barbecues and tailgates, but will thrive for small and medium sized ones. 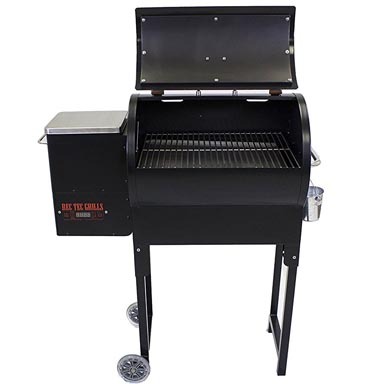 Unlike with many other grills on which you have to be constantly opening heating vents and adjusting temperatures, the REC TEC does essentially all of the heavy lifting. As long as you know how to flip a switch and adjust a temperature, it’s very easy to use. Now that we’ve talked about the REC TEC Mini, let’s compare it to it’s older brother, the REC TEC Standard. The most obvious difference is in their respective sizes. While the Mini Measures in at 16 inches x 33 inches x 41 inches and weighs in at 100 pounds, the Standard measures in at nearly twice that size. This allows it to cook a great deal more food, but does so at the expense of portability. It would be very difficult to take the Standard to a tailgate. For double the size you’re also looking at double the cost. Both grills possess excellent temperature capabilities, possessing built-in thermostats that set their exactly temperatures within 2 or 3 °F. A huge difference between the two is in their pellet container size. While the Mini can hold up to 15 pounds of pellets at once, the Standard can hold up to 40 pounds of pellets at once. This means you can cook for much longer without needing to re-fill the hopper. In essence, both the REC TEC Mini and the REC TEC Standard are terrific grills. If you’re looking for more cooking capacity, the Standard is the one to go with. If you’re looking for more portability, you’ve got to go with the Mini. 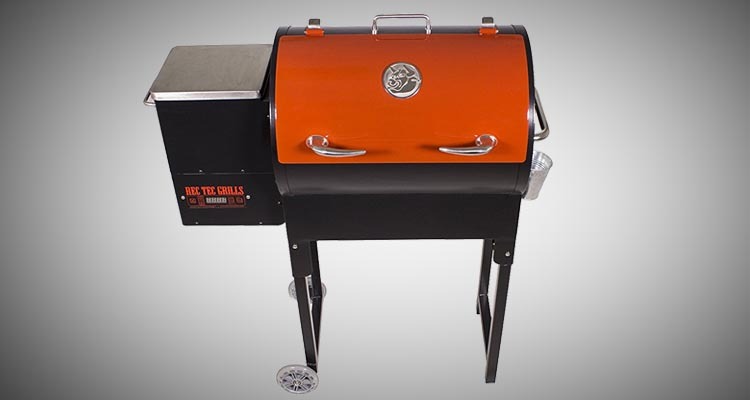 Overall, the REC TEC Mini Pellet Grill is a terrific grill for those who are looking for a mid sized pellet grill for the home, with the ability to pack it up for tailgates. While you trade in some portability for the size, that makes it a very versatile grill. 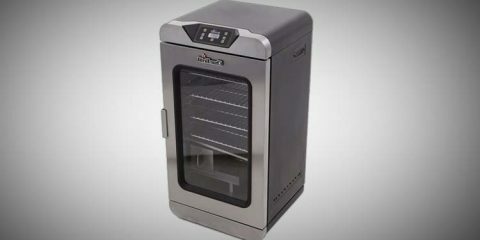 This grill’s huge temperature range as well as its ability to hold temperatures consistently make it very easy to use. While it’s a little expensive, it’s definitely worth its cost. 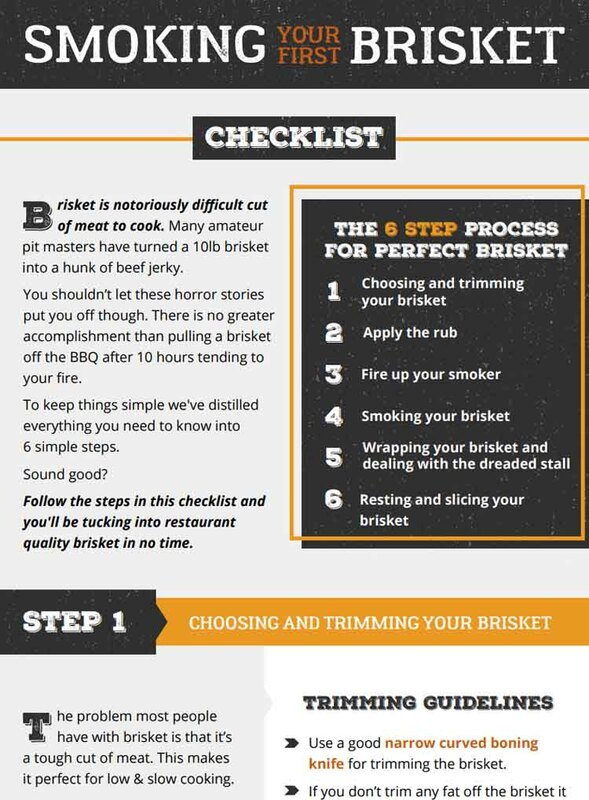 Durable, highly-functional, and easy to use, it cooks meat with the best of ‘em.